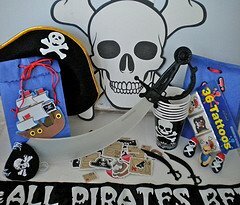 Pirate birthday supplies of eye patches, pirate hats and swords turn each guest into a Black Beard or Jack Spratt. 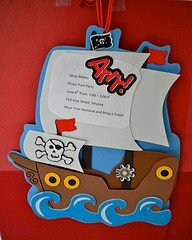 Here are some great pirate party ideas starting with the invitations to the take home party favors. There are pirate birthday supplies for every age pirate...from pirate flags to pirate treasure maps and gold coins to treasure chests. 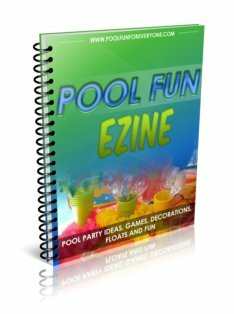 This is one of my favorite kids pool party ideas ...probably because the kids had sooo much fun (and so did I). Here are lots of pirate party ideas that will turn every guest into Jack Sparrow. 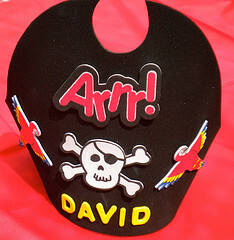 Pirate invitations set the theme for an adventurous pirate themed pool party. A pirate treasure map can be used for the invite showing "X marks the spot" for the party location. I used a foam pirate ship foam craft from Oriental Trading. The craft kit was on clearance as part of a Vacation Bible School theme and I just used the foam stickers differently to make our invites. The birthday guests loved these pirate invitations. Easy to assemble foam stickers made it a snap. I glued on the invitation details and punched a hole in the top for the string. The pirate pool party invites were hand delivered. Long after the party was over, the kids still have these ship invitations hanging in their bedroom. Sail on Over to the Pirate Den. If you like printing out your own invitations you can find free printable invites on line at the Hewlett Packard Creative Studio. There is a free printable pirate invite - double-sided with a pirate treasure map on the back. Click on this link to see if you like it. Make an impression by using these Black Pirate Bounty Bags to deliver your invite. Invitations do a lot more than just tell a person the time and place, they set the tone for the party and help build excitement and anticipation for the big event. By sending an invite that's more than just a piece of paper, it lets your guests know that this is not going to be an ordinary party. Place the invitation - such as a pirate treasure map with the party details - in the black pouch with a couple of cold coins. Either hand deliver them or mail them in the appropriate size mailer. I loved the bold colors of black, white and red on these 9" Pirate Dinner Plates and used them for our party. Simply use red, white or black napkins. Disposable plastic tablecloths from the Dollar Store work great. Provide foam swords for all of your buccaneers. They can be played with in and out of the pool. Use them for party games. These swords are about 27" long and quite sturdy. The foam makes them fun and safe to play with. Let the guests take them home as a take home favor. What's a pirate without an eye patch? For very little cost you can turn your guests into authentic pirates with pirate eye patches for everyone. Be sure to get the soft ones and not the hard plastic as they could injure someone's eye. The adults enjoyed having their own as much as the kids. This little guy kept his eye patch on during the entire party and wanted it left on when he got home. The felt pirate eye patches, plastic swords, and pirate hats were given out when the guests first arrived and then taken home as party favors. Pirate temporary tattoos were a big hit. While waiting for the guests to all arrive, let each child and adult pick out their favorite tattoo. Have a bowl of water and a washcloth ready. Remove the plastic protective shield, place the tattoo on the arm and then apply a wet washcloth. Hold it for a few seconds and you are done. The tattoos stay on really well even when swimming in the pool. 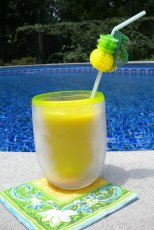 Have pirate themed beach balls floating in the pool and Beware signs posted by the pool gate. Hang pirate flags and skull bones on the party table. Scatter coins on the path to the party and have pirate music playing. 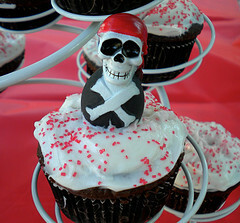 Cupcakes make the perfect pirate birthday cake when topped with pirate figurines or skulls. The plastic finger puppets make nice little take home favors as well. Sprinkle the frosting with some colored sugar for a little more embellishment. These fun cupcakes are so much easier to make and serve than a traditional layered cake. Display the cupcakes in a cupcake tower and use it as your centerpiece. 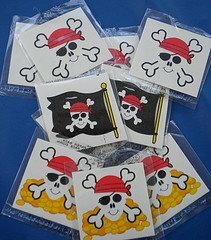 Pirate party favors include swords, patches and hats to be used during the party as well as take-home party bags of treasures. 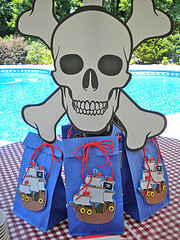 These pirate party bags were made from blue lunch bags that I had bought at Target and a simple craft kit from Oriental Trading. The craft kit was actually for a Vacation Bible School program in their clearance section. I thought how perfect for our party bags. I often use crafts, kits or items for other things that what they were intended for. Plastic finger puppets become cupcake toppers and craft kits are used for invitations, party bags or decorations. Our little Mates will be going home with some good "loot." 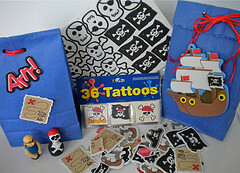 Pirate stickers, tattoos and finger puppets will go into the party bags. Other ideas for party bags are these colorful ones from Amazon - you can get 20 of them for just over $6.00. They are 12" high and 5" wide. These are plastic, not paper bags, that come with a blue twist tie. They are study, won't split open, and large enough to fill with lots of goodies. Another idea is to use black pirate pouches. Made of polyester fabric with a drawstring, these 17" bags are nice and roomy. They look small in the picture - but they are not. They can actually be worn as a back pack and be used after the party for kids to carry stuff around or in the car. They come as 12 pieces for around $14 - so just a little over a dollar a piece. Free shipping if you are a Prime Member. When guests first arrive they can decorate their own pirate hat with this kit that includes the foam hat, tons of stickers and a coil band. I put some of the extra stickers in their party bags - but there was still lots of them left over. The self adhesive back made it easy for every one to put on their own stickers. These foam hats worked great out by the pool, since it didn't matter if they got wet. Although I wouldn't suggest swimming with them. Pirate beach balls were used for the pirate party games and went home as party favors as well. There are small ones at 7" and larger ones at 9". 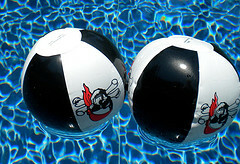 The boys loved "batting" the beach balls with their plastic pirate swords and tossing them in the pool. 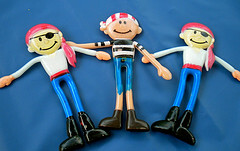 These bendable pirate figurines are durable and tough. Before they walked out of the pool gate, the boys were playing with them. 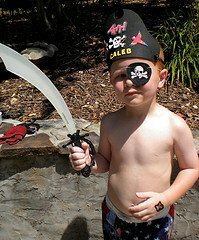 The ages of our little buccaneers were 3- 7 years old. These pirate rings were great. Vivid colors and thick durable plastic. You aren't going to find a treasure like this one easily. Oh no, this pirate party favor is only for those who are willing to dive for sunken treasures. Place the ring in a weighted diving egg and throw it in the pool at a depth that is comfortable for your guests. One at a time have each guest swim to the bottom of the pool to get their treasure. You can get them with free shipping if you're an Amazon Prime Member for less than $6.00 for 12. 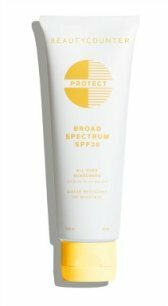 If you are not an Amazon Prime Member, you are missing out on some great benefits - like free shipping - often times on items that are just a couple of dollars. You can also find a wider variety of party supplies in one place. You can try it for just a month and if you don't see the benefits then just cancel.